Environmental Protection (DEP) Commissioner Vincent Sapienza, Sanitation Commissioner (DSNY) Kathryn Garcia, NYC Parks Commissioner Mitchell J. Silver, FAICP, and U.S. Environmental Protection Agency Region 2 Administrator Pete Lopez today launched “Clean Streets = Clean Beaches”, a public information campaign and beach clean-up program aimed at reducing littering and improving the cleanliness and aesthetics of New York City beaches. When it rains, trash and debris discarded on city streets and sidewalks can be washed down storm drains and end up on beaches. This summer, “Clean Streets = Clean Beaches” posters will be displayed at area beaches and on approximately 5,000 Sanitation vehicles citywide. 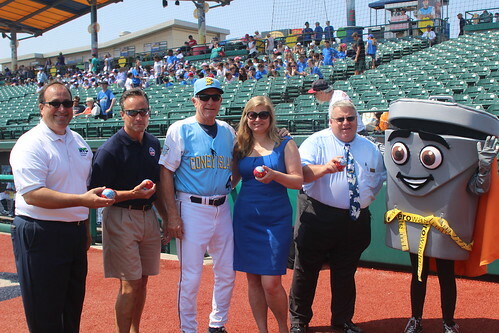 The program was launched at MCU Park in Coney Island, home of the Brooklyn Cyclones. The “Clean Streets = Clean Beaches” campaign began in the early 1990s to highlight the link between litter on the streets and trash found on area beaches. The 2018 program will utilize an informational poster with the slogan “don’t mess up summer” for display at area beaches as well as on Department of Sanitation fleet vehicles, which include approximately 450 mechanical brooms that sweep litter from more than 6,000 miles of streets per day. Additionally, the Department services more than 25,000 litter baskets daily. DEP regularly inspects and cleans approximately 148,000 catch basins city-wide, which trap litter before it can make its way into the sewer line. DEP operates and maintains 23 booms and nets that drain over 60,000 acres and 58 sewer outfalls. These nets are serviced by four specialized skimmer vessels that collect trash and other debris that makes it through the catch basins, including wood, plastic, metal, rubber, and glass, before it enters local waterways. The total amount of trash and debris collected by the boom and skim program has dropped by 75 percent since 2010. DEP has also built litter control devices within sewer outfalls along the Bronx River, the Gowanus Canal, and Newtown Creek that use hydraulic bar screens and nylon netting systems to capture litter before it can pollute the waterways. DEP will also distribute collapsible, reusable water bottles at City beaches throughout the summer that people can use instead of disposable plastic bottles. For more information, visit nyc.gov/dep, like us on Facebook, or follow us on Twitter.